i tried downloading 2.7.4(i previously tried installing 2.7.1 which i already had saved previously, and it installs, but the era.exe doesn't run) from yandex, and the site isn't working for me. i was able to download all the stuff(all the versions, i guess?) on that page into one folder, but it's not displaying an easily verifiable exe file that way(just the folders you'd see shown once they were installed in the h3 folder, and that doesn't include the era exe or anything outside the folders themselves). in case of any of that is confusing, i can't download 2.7.4, for reasons unknown. this is on both internet browsers i use. yandex isn't being cut-off because of that international spy conflict, is it? Fred you need to click to latest version then the download link should appear at the top of the page. If it doesn't, temporarily disable your 98768967896789869475695867589645 scripts blockers. Edited by fred79 at 16:23, 11 Apr 2018.
lol, i did that. i brought down the chinese walls that keep the bad stuff out, and when i click on it, nothing happens. i get the tab with the options to "download to yandisk" and "download", and the download button doesn't work. on the other browser(the less secure one), all i can download is the whole page, which i specified above, won't work to install correctly. Eh, don't know what to tell you, when I try a blue horizontal bar at the top of the page with the file to download appears. Edited by fred79 at 16:31, 11 Apr 2018.
did france boycott anything russian? is france part of that? edit: damn. attempting to use a russian ip blocked the site entirely. Edited by Galaad at 16:32, 11 Apr 2018. I actually had a meeting with Putin lately, and he assured me his #1 priority was to make sure user fred79 from HC could never download Era 2, because his Forge town represents a serious threat to world peace. Kidding aside, maybe try from a browser you never used before, maybe you tweaked too much stuff or Idk. Edited by fred79 at 16:32, 11 Apr 2018. LOL, nice. did you see my edit? i'm screwed, man. i get the blue tab at the top too, but when i click the download link on it, it does nothing. but when i click the download link on it, it does nothing. I could bet this is because you are blocking it somehow. Get a fresh new browser and try from it. false positive from a stupid antivirus? i found the issue. it was from a new security addon. Edited by fred79 at 16:57, 11 Apr 2018.
nope. new version still crashes on attempt to run the exe. running exe with service pack 3, with admin rights. are you available for debugging, bersy? dude, if you're running a unix operating system, you most likely know more about computers than i do. And here I thought I was the only one running Heroes 3 on Linux. I don't think you can. You can use winecfg to set the Windows version you want, but that doesn't fix it. I've managed to fix the Lua script issue by copying the Scripts folder from Heroes3ModsWogData to Heroes3Data. But unfortunately this only works for 2.7.3. When doing this on 2.7.4, it gives a different error I haven't managed to figure out. lol, see? i thought you were running unix. i've forgotten nearly everything i was taught in ait. Edited by Alyx182008 at 18:48, 11 Apr 2018. The good news, I got Era 2.7.4 working on Wine. Bad news is, it's gonna be complicated to explain, but I'll try. 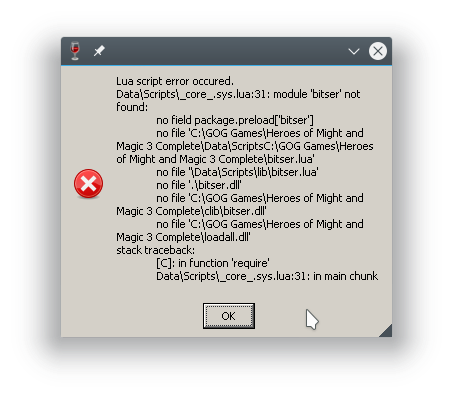 So after you copy Scripts folder from Heroes3ModsWogData to Heroes3Data, you'll get this error. So what I'm seeing in my case, is that the game is looking for a "ScriptsC:" folder in Heroes3Data. So what you need to do is recreate the path it expects to find. In my case, I created a "ScriptsC:" folder in Heroes3Data, then created a "GOG Games" folder, and so on. 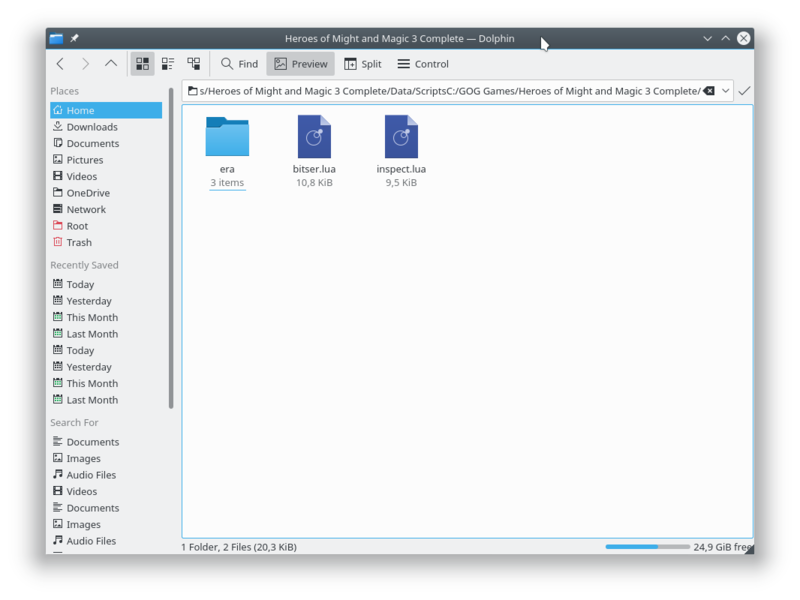 Then you copy the contents of Heroes3ModsWogDataScriptslib to the previously created path. This is how that looks like for me. Is this by any chance the error you're getting when running the latest Era on Windows XP? i don't run xp. xp's obsolete, man. Sorry, I guess I misunderstood. So then, what OS are you running exactly? I'm trying to see if I can recreate whatever issue you're having. Edited by Galaad at 00:02, 12 May 2018. Hah, Alyx I did your solution for 2.7.3 shortly after you posted then had to rush to RL and in the meantime you posted solution for 2.7.4. I will likely try your solution for 2.7.4 at a later time. Edit: 2.7.4 solution worked too. Thanks for your help and cheers to a fellow Linux user!